Pumpkin Pie Pull-Apart Bread — Pip and Ebby - easy, delicious recipes! Enjoy Pumpkin Pie in the form of a loaf of bread! Great for breakfast, a snack OR dessert! No knives necessary! Pull pieces off with your fingers and enjoy! I am writing from Orlando, where my family and I are enjoying the tail end of a very cherished vacation. Our 6-year-old son was granted a wish from the Make-a-Wish Foundation and we have been spoiled beyond words since we arrived last Friday. We are in awe about the treatment we have received the past few days. It has been a magical dream come true that I could never explain to anyone in words. We are grateful and blessed and thankful and happy! It will be so sad to go home to snow-covered Minnesota on Thursday. Tomorrow is our last full day here, and we are hoping to hit two of the Disney parks for a few hours each before crashing into our Villa beds for the last time. I made a few loaves of this Pumpkin Pie Bread way back, oh, a few weeks ago (time outside this place seems impossible to gauge). It was an alternate option for Pumpkin Pie on Thanksgiving. Or a dessert-izer, for some (me). I hope you enjoy it. It is incredible and VERY hard to stop eating, much like these Pumpkin Cookies and these Pumpkin Pie Bars. Preheat your oven to 350 degrees F. Coat two 9x5(ish) loaf pans with cooking spray and set aside. 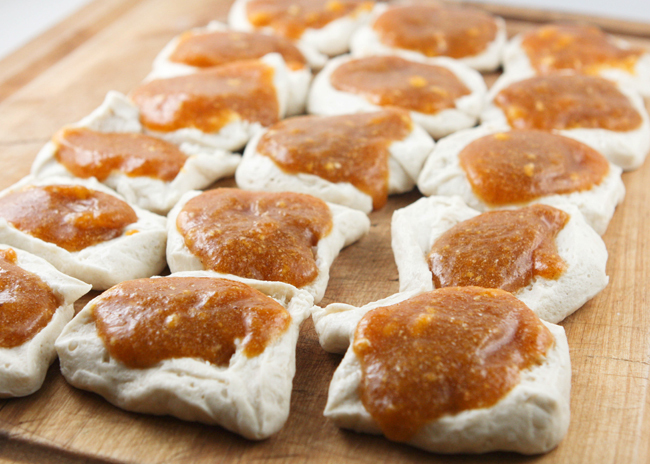 Remove the refrigerated buttermilk biscuits from two 16.3-oz. containers (8 count each - I used Grands! biscuits). Slice each biscuit lengthwise to create 32 total rounds (16 for each loaf pan) and place them on a flat work surface. Using a spoon, divide the mixture between the biscuits. Carefully stack 8 of the biscuits on top of one another. Turn them sideways and add to one of the prepared pans (you will be adding more, so leave room). Warning: THIS IS MESSY. That's ok. Messy = tasty. Stack 8 more biscuits, making sure the top biscuit is filling-side down (the filling should not touch the pan). Turn sideways and add to the same loaf pan. Spread the pieces out to fit. They should look something like this..
Repeat process with the remaining loaf pan and biscuits. Bake in the preheated oven for 40 minutes, or until the dough is cooked through. My loaves were done at 40 minutes on the nose. Stir until the mixture is smooth. Drizzle over the bread, dividing between the two loaves. Serve warm! Back to my last morsels of vacation! Enjoy your week, everyone. Thank you so much for reading. Enjoy pumpkin pie in a loaf of bread! No knives necessary. Preheat oven to 350 degrees F. Coat two 9x5(ish) loaf pans with cooking spray and set aside. Place biscuit halves on a flat work surface. 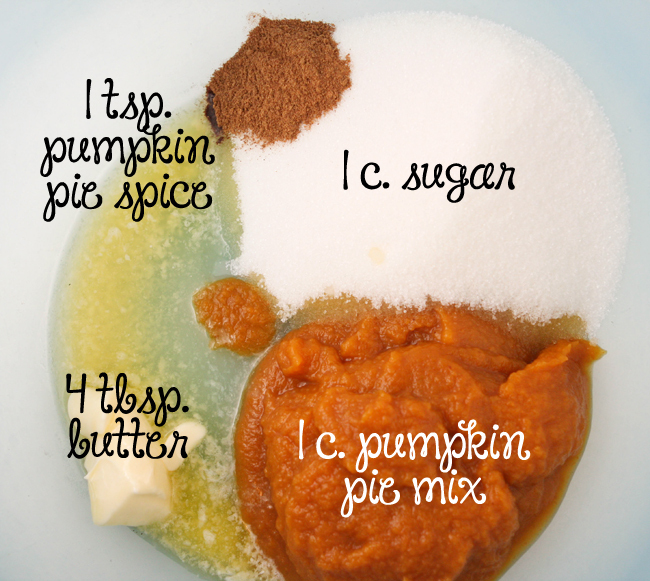 In a large bowl, combine the sugar, pumpkin pie mix, pumpkin pie spice and butter. Stir until combined. Using a spoon, divide the mixture between the biscuits. Carefully stack 8 of the biscuits on top of each other, turn sideways and add to one of the prepared pans (you will be adding more, so leave room). Stack 8 more biscuits, making sure the top biscuit is filling-side down (filling should not touch pan). Turn sideways and add to the same loaf pan. Spread the pieces out to fit. Repeat process with remaining loaf pan and biscuits. Bake in preheated oven for 40 minutes, or until dough is cooked through. In a medium bowl, combine confectioners’ sugar, milk and vanilla. Stir until smooth. Divide the frosting between the loaves, pouring over the top. Serve warm!